The trunk of the tree is perfectly upright and straight, with the apex of the trunk directly over the base. Branches are regular, and progressively decrease in width and level of foliage from the thickest branches at the bottom of the tree to the thinner, shortest branches at the top. 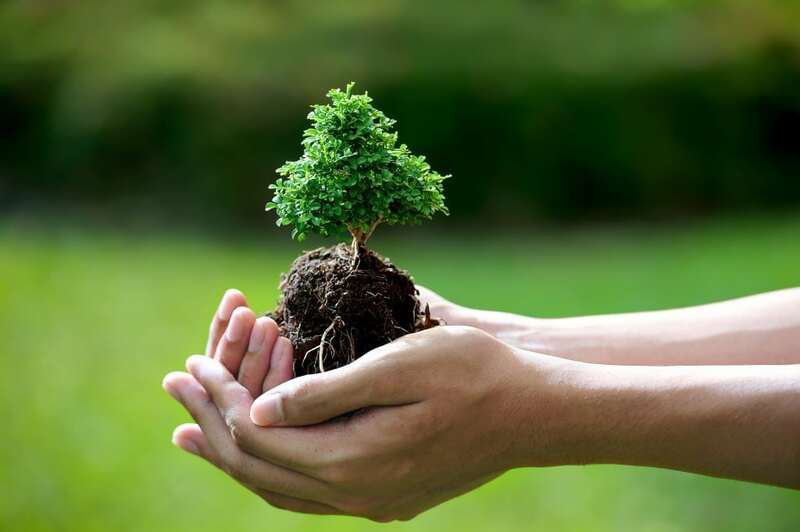 Roots should be clearly visible on the surface of the soil, extending from the centre of the tree base, radiating symmetrically around the entire trunk. In nature, the species of trees that most resemble the formal upright style are Cypress and cedar trees. The formal upright style is considered by many bonsai enthusiasts to be the basis of bonsai tradition, and the goal to which many trainers strive. However, it can also be one of the most challenging styles to create as it requires great symmetry and balance, which can be thrown out by simply a single branch that is not quite as it should be. These trees are not perfectly straight – their trunks and branches show evidence of curving and may follow a tortuous course. However ultimately the apex of the trunk is still directly over the base of the tree, where it enters the soil. As in the formal upright style, the branches become progressively shorter and thinner as they progress up the trunk. 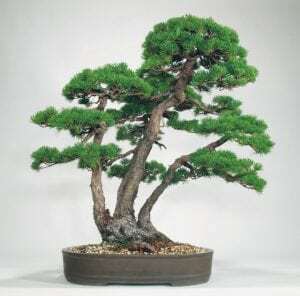 In the slanting style, the trunk of the bonsai is straight as in the formal upright style, with no visible curves. However, instead of the apex of the tree being directly over the base of the tree, the trunk slants from the soil at a significant angle, leading to the apex being to the left or right of the base. This style of tree has a large part of its trunk free of any bark. The exposed wood is bleached white after it is exposed to the elements, such as sunlight and excessive wind, giving it the appearance of weathered driftwood. This occurrence does not happen in nature except in cases of disease or old age in trees. When the designer is creating this is style, it is important to remember that the tree cannot be ring barked – there must be a significant portion of living bark that connects the branches and leaves of the tree down to the roots, as it is only under the bark that water and nutrients are able to be transported from the roots up to the living portions of the tree. Driftwood style trees often look old and weathered, regardless of the actual age of the trained specimen. This style is best used with species such as pine, juniper and cedar trees. Cascade style bonsais have their branches and leaves hanging below the base of the tree trunk. 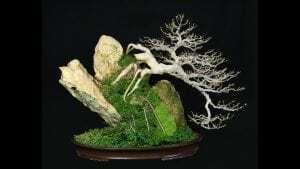 These aim to mimic trees in nature that grow off cliff faces, and it is considered one of the oldest forms of bonsai training. The visual impact of this style is created by the stark angles between the trunk of the tree and the overhanging branches and foliage. 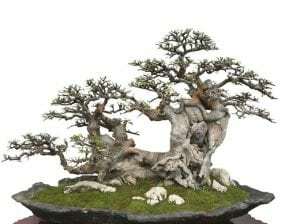 This style is popular in smaller bonsai forms. In the semi cascade style, the branches of the tree are angled exactly level to the base of the tree. 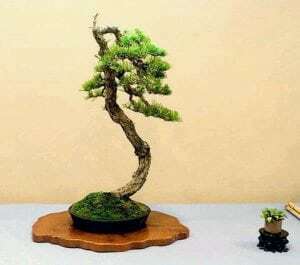 In some terminologies, semi-cascade can be used to describe a style in which some of the branches are found below the base and others above, but the apex of the tree should still be directly in line or slightly below the tree base or bonsai tray. 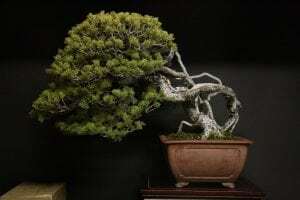 As the name implies, this style merely refers to a bonsai in which there are multiple trunks extending below the base of the trunk in the cascade style. This style aims to emulate the appearance of a tree that has been struck in two by lightning, or has been severely damaged by another event. The trunk of the tree is hollow and deeply split. This style is usually created by careful chiseling and weathering of the trunk by the designer. There are only a limited number of tree species that can be used for this style, including conifers, deciduous trees and broadleaf evergreen species. In this style, the tree is designed together with a large rock with many cracks and fissures. These cracks are filled with soil, and the tree roots are trained to grow in this soil within the rock. In some cases, the tree may begin to form contours following the natural shape of the rock, while in others the roots may remain in the rock while the tree may escape its containment and being to grow separately to the rock. 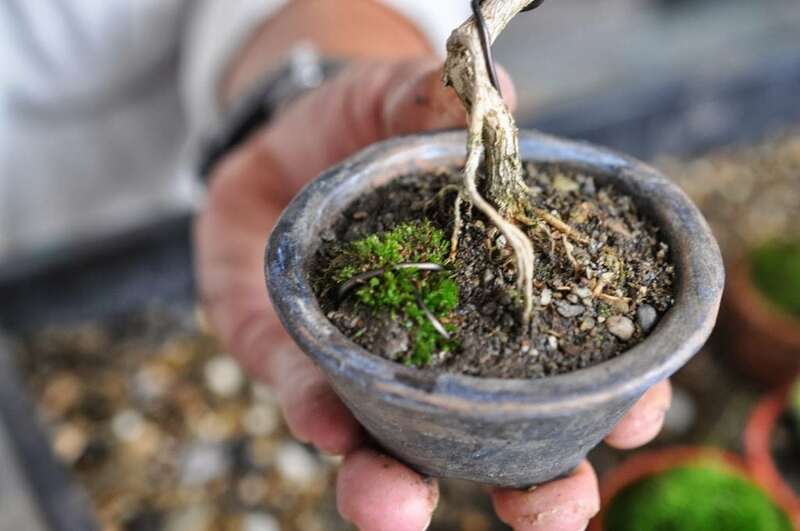 Some bonsai trees are designed to have roots clearly exposed, not covered by soil and extending directly from the trunk. Sometimes, the roots grow and bend to become up to half the height of the main tree trunk. 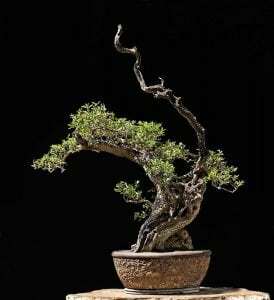 In the root over rock style, the roots of the bonsai tree are exposed and traverse closely over a rock. 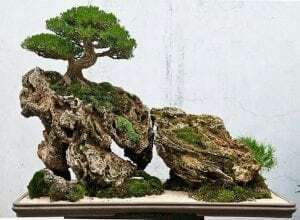 However, unlike the clinging to a rock style, the roots do not originate from soil within the rock, but rather from soil in the tray, and then the roots simply traverse over the rock. 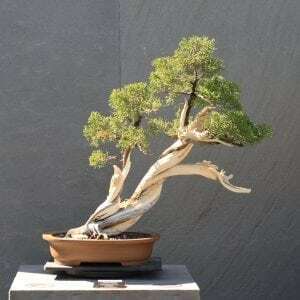 There are a number of multiple trunk styles, used to describe any bonsai where more than one trunk extends from a single root. In twin trunk styles, two trunks emerge from one root system. Usually, the two trunks are joined at the base or touch each other and then split just above the level of the soil. In most cases, there is one dominant trunk which is thicker than the other, and this trunk is also usually taller. 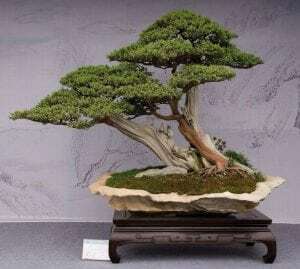 It is important in competitions that both of the twin trunks are visible when viewing the bonsai from the front. The branches on the separate trunks may not grow towards each other. In three trunk styles, there are three separate trunks emerging from a single base. As in the twin trunk style, there is usually one dominant trunk that is taller and thicker than the others. Multiple trunk styles continue to include five-trunk, seven-trunk and nine-trunk styles, however it is highly unusual to have an even number of trunks (except for the twin trunk style) as symmetry is generally avoided to make the tree appear as natural as possible. The multiple trunk styles are also known as a clump style, which imitates the natural occurrence when a number of seeds germinate from a single cone, for example. A variation of the clump style is the turtle stump style, in which the multiple trunks arise not from the flat soil, but from an exposed, rounded formation of ground roots. The style gets its name from the shape of the roots, which form a rounded shape reminiscent of a turtle’s back. These styles are similar to the multiple trunk styles described above, however each individual tree has its own roots rather than the single root system of the multiple trunk styles. In the two tree style, as in the twin trunk style, there is generally a dominant tree which is larger and has a thicker trunk than the other. When between three and nine separate trees are placed together in a bonsai tray, they are known as ‘group settings’. Usually it is an odd number of trees chosen, that vary in trunk width and height. They should, however, look similar in shape, proportion and foliage, and there should be no more than two trees directly in line with each other in the setting. 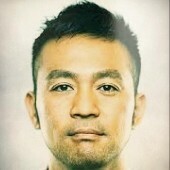 Again, this is to create a more natural and less artificial look. 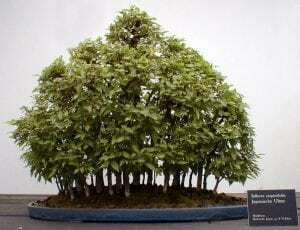 The forest style refers to any more than nine trees planted in a single bonsai tray. Most of the time, the tray used is long and shallow. Traditionally, all the trees in a forest style are of the same species, and they are all of different heights to create an aesthetically pleasing look, create interest for viewers and to emulate the fact that in an actual forest, trees will be of differing sizes and maturities. 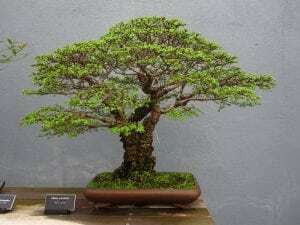 Sometimes, the smallest trees are placed in the back of the tree to create a sense of perspective, so that the viewer feels that he is gazing into a vast forest when viewing the bonsai setting. 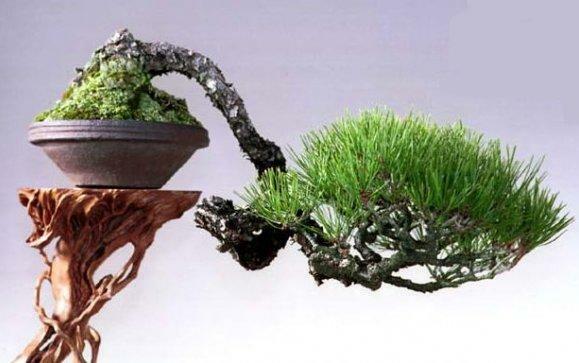 This style of bonsai is designed to imitate an occurrence that happens often in nature, whereby a tree falls over onto its side. If the tree has not died and still has an intact root system, new branches will form extending from the toppled tree trunk, forming what looks like a number of new, vertical trunks. In some cases, if the tree stays alive for long enough, new root systems can form and extend from portions of the toppled over trunk that are buried under the soil. Bonsais can be fashioned to imitate this phenomenon, which is known as a raft style. Within this style, the straight line raft has straight, upright trunks, and the trees are in a symmetrical, straight line. The trunks often give the impression that they are a number of separate trees, but in reality the ‘separate’ trunks of simply branches of a single tree, extending from a trunk that has been placed horizontally. The sinuous raft style is similar to the straight line raft described above, in that the formation of trunks is created by the growth of branches from a tree trunk placed on its side. However with a sinuous raft, the original trunk is tortuous and bent, meaning that the branches growing out of it are all at differing levels and do not appear in a straight line. 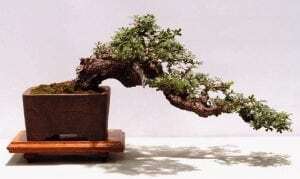 The wind-swept bonsai style is a style used to recreate the appearance of a tree that has been subjected to large wind forces blowing from a single direction. This often occurs in nature if trees are growing on an exposed shoreline or mountain ridge. 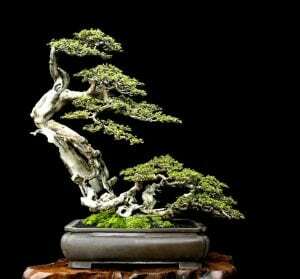 Usually, the windswept style creates a slanted type picture, with the trunk and branches of the bonsai all slanting in a single direction. 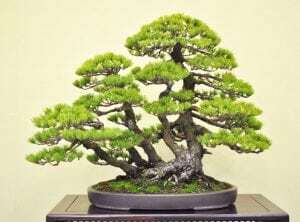 The bonsai has a long, thin trunk that often curves sinuously, with only very few branches towards the upper end of the trunk. The name of the style comes from the well-known Chinese literati artists, who created paintings of sparsely foliaged trees with long, thin and contorted trunks and branches. 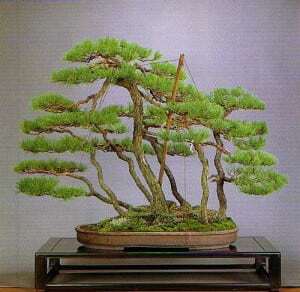 In the broom style, the bonsai is trained so that the trunk is perfectly straight, as in the formal upright style. Rather than the branches becoming progressively shorter towards the apex of the tree, however, the foliage and branches of the tree extend outwards in all directions at the apex. The end result is a rounded, crown-like appearance formed by the leaves and branches. 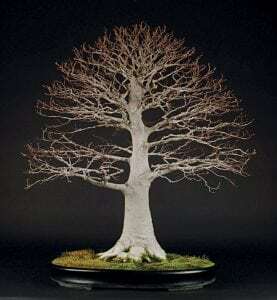 This style is suitable for tree species that have many thin, pliable branches. A good example is the Elm tree. 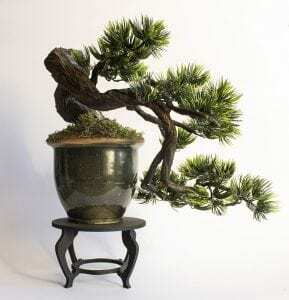 As can be seen by this extensive list of styles, designing and training a bonsai is an intricate artwork and many factors need to be taken into consideration. 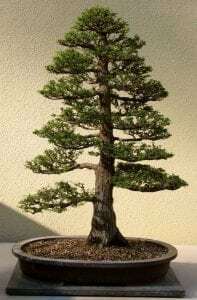 Once you have decided on the species and the style of the bonsai, you need to consider the environment the bonsai is going to be in.